Would the United States and China ever go to war? You are at:Home»China»Would the United States and China ever go to war? A recent study from the American Enterprise Institute concluded that the U.S. Air Force lacks the stealth aircraft to successfully fight China. One expert told Air Force Times it is unlikely China and the U.S. would ever go to war because their two economies are so interconnected, but a reader pointed out afterward that people said the same thing about Great Britain and Germany, which came to blows twice in the last century. Prior to World War I, Germany’s biggest trading partners were Britain and France while Germany was also one of the biggest investors in Russia, giving rise to the popular notion that a major European war was unlikely – yet the war came, said Dean Cheng, a China expert with the Heritage Foundation think tank in Washington. Now, as then, economic interests do not trump national security interests, so China and the United States are not so interconnected that they will never go to war, Cheng said. The reason the Chinese have bought hundreds of billions of dollars in U.S. bonds is the U.S. economy is the only one big enough to handle all that money, he said. For both China and the U.S, the relationship is pure business. “There’s nothing in the Chinese side of their actions to make them say, ‘You know, I’m willing to take something of a loss here,’ or, ‘I am buying American bonds in peace time because I want to help express sympathy for the United States; the same way nobody here buys Chinese goods – very, very few people – buy Chinese goods because, ‘Well, you know, I want to help China,’” Cheng said. It is definitely NOT a smart move to beleive economic interest will preclude a war. History proves this point. For 10 years, after WWI, Winston Churchill warned of the dangers of the intent and direction of the German nation purchasing and building a war machine. Like Senator Fred Thompson suggested, we should be taking a more aggressive stance of demanding certain restrictions in defense purchase by China, in return for increased commerce. China, as did Germany, takes its economic gains and purchases its war machine. Maybe not in direct proportion, but aircraft carriers, stealth fighters, and cruise missiles do not sound like a peaceful intent. We can also argue that “defense” usually does not include the ability to project military power (cruise missiles, aircraft carrier). After the recent conflict between FSU and Georgia, Gorbachev was interviewed and before he was finished gave a warning to watch the current defense spending. This warning, I believe is definitely warranted. How do we change the course and avoid a war that no one wants? That is an entirely new blog/article. 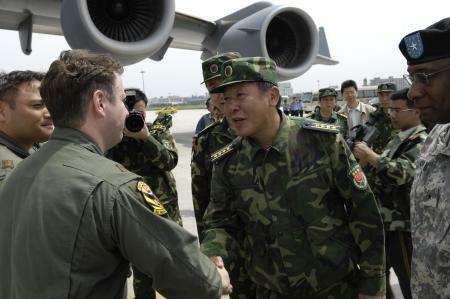 The Chinese intent for a more modern and projectable military does not necessarily mean a World War or even a conflict with the US. Many analysts believe this to be for regional leverage. However, energy plays a very important factor into the subject. The Chinese are very aggressive in securing energy resources to meet future demands. Also, in any regional conflicts, the US is a major ally with China’s neighbors (India, Tiawan, etc). So, in conclusion, we definitely see an intent by the Chinese to exert a formidable military option in the future. This does not necessarily mean a world war or US-China conflict. However, we should definitely NOT assume an intertwined economy would preclude such an event. It is my personal opinion that the true “enemy” is fear and ignorance. If we choose to remain on oil forever, we will meet the Chinese, Russians, Germans, British, (everyone) at the last oil well with guns in hand. This is the right webpage for everyone who wants to understand this topic. You know a whole lot its almost hard to argue with you (not that I really would want to…HaHa). You definitely put a brand new spin on a subject that has been written about for many years. Great stuff, just great!